Initially, a set of guidelines for the use of ultrasound contrast agents was published in 2004 dealing only with liver applications. A second edition of the guidelines in 2008 reflected changes in the available contrast agents and updated the guidelines for the liver, as well as implementing some non-liver applications. Time has moved on, and the need for international guidelines on the use of CEUS in the liver has become apparent. The present document describes the third iteration of recommendations for the hepatic use of contrast enhanced ultrasound (CEUS) using contrast specific imaging techniques. This joint WFUMB-EFSUMB initiative has implicated experts from major leading ultrasound societies worldwide. These liver CEUS guidelines are simultaneously published in the official journals of both organizing federations (i.e., Ultrasound in Medicine and Biology for WFUMB and Ultraschall in der Medizin/European Journal of Ultrasound for EFSUMB). These guidelines and recommendations provide general advice on the use of all currently clinically available ultrasound contrast agents (UCA). They are intended to create standard protocols for the use and administration of UCA in liver applications on an international basis and improve the management of patients worldwide. General overview, steering committee and contributions. The present document describes the third iteration of recommendations for the hepatic use of contrast enhanced ultrasound (CEUS) and contrast specific imaging techniques introduced ten years ago in Europe and Canada. Initially, a set of guidelines for the use of ultrasound contrast agents (UCA) was published in the 2004 edition of Ultraschall in der Medizin (European Journal of Ultrasound) dealing only with liver applications . Subsequently, CEUS was introduced into other important guidelines and recommendations for the diagnostic strategy of focal liver lesions (FLL) in cirrhosis, including the guidelines of the American Association for the Study of Liver Diseases (AASLD) 2005 , the Asian Pacific Association for the Study of the Liver consensus recommendations on hepatocellular carcinoma (HCC)  and the recommendations of the Japan Society of Hepatology . A second edition of the guidelines in 2008 reflected changes in the available contrast agents and updated the guidelines for the liver . CEUS has also been recommended in guidelines for several non-liver applications, which have recently been updated under the auspices of European Federation of Societies for Ultrasound in Medicine and Biology (EFSUMB) as non-liver guidelines . Time has moved on, and the need for worldwide guidelines on the use of CEUS in the liver has become apparent. World Federation for Ultrasound in Medicine and Biology (WFUMB) and EFSUMB initiated further discussions in 2010, in conjunction with the Asian Federation of Societies for Ultrasound in Medicine and Biology (AFSUMB), American Institute of Ultrasound in Medicine (AIUM), Australasian Society for Ultrasound in Medicine (ASUM) and International Contrast Ultrasound Society (ICUS) to bring the 2008 liver guidelines up-to-date, recognizing the fact that contrast agents are now licensed in many parts of the world, including Australasia, Brazil, Canada, China, Europe, India, Japan and Korea. This joint WFUMB-EFSUMB venture has resulted in a liver CEUS simultaneous duplicate on liver CEUS in the official journals of WFUMB and EFSUMB (i. e., Ultrasound in Medicine and Biology and Ultraschall in der Medizin/European Journal of Ultrasound). To produce the new CEUS liver guidelines and recommendations, a meeting of representatives from 36 European (France, Denmark, Germany, Italy and the UK), North American (Canada and the USA), Asian (China, India, Japan and Korea) and Australian experts was held in Chicago in December 2010. While a significant portion of the work was accomplished at the meeting, the group continued to meet via conference calls and at local meetings. As before, these guidelines are based on comprehensive literature surveys, including results from prospective clinical trials. On topics where no significant study data were available, evidence was obtained from expert committee reports or was based on the consensus of experts in the field of ultrasound (US) and CEUS during the consensus conferences. During the meeting of experts in Chicago, many additional new developments were discussed and included. Others were believed to be too early in their development to be included in the current recommendations. These guidelines and recommendations provide general advice on the use of UCA. They are intended to create standard protocols for the use and administration of UCA in liver applications on an international basis and improve the management of patients. Individual cases must be managed on the basis of all clinical data available. The development of microbubble ultrasound contrast agents has overcome some of the limitations of conventional B-mode and Doppler ultrasound techniques for the liver and enabled the display of the parenchymal microvasculature . The enhancement patterns of lesions can be studied during all vascular phases (arterial, portal venous, late and postvascular phases), in a similar fashion to contrast enhanced computed tomography (CECT) and contrast enhanced magnetic resonance imaging (CEMRI) but in real time and under full control of the ultrasound operator. UCA have different pharmacokinetics from commonly used contrast agents for computed tomography (CT) and magnetic resonance imaging (MRI) in that they are confined to the vascular space whereas the majority of contrast agents for CT and MRI are rapidly cleared from the blood pool into the extravascular space . In addition, some UCA have a late or a postvascular phase during which they are retained in the liver (and in the spleen) . An inherent advantage of CEUS is the opportunity to assess the contrast enhancement patterns in real time, with a much higher temporal resolution than is possible with other imaging modalities, so that the enhancement dynamics of lesions can be studied. There is no need to predefine scan time points or to perform bolus tracking. Furthermore, the excellent tolerance and safety profiles of UCA allow for their repeated administrations in the same session when needed. Regrettably, UCA studies are subject to the same limitations as other types of ultrasound imaging: as a general rule, if the baseline ultrasound is suboptimal, CEUS may be disappointing. Limitations of resolution of CEUS or particular scanning conditions mean that the smallest detectable lesions range between 3 and 5 mm in diameter . Very small FLL may be overlooked. Subdiaphragmatic lesions, especially those in segment VIII, may not be accessible to conventional US or CEUS. Intercostal scanning and positioning the patient in the left decubitus position can help reduce this limitation. Since CEUS has limited penetration, especially in steatosis, deep-seated lesions may not be accessible. Again, scanning in the left lateral decubitus position brings the liver forward and closer to the transducer and can help to reduce this limitation; it should be part of the routine survey. The falciform ligament and surrounding fat can cause an enhancement defect that may be confused with a FLL. SonoVue® (sulfur hexafluoride with a phospholipid shell) Bracco SpA, Milan, Italy, introduced in 2001. Licensed in Europe, China, India, Korea, Hong Kong, New Zealand, Singapore and Brazil. Definity®/Luminity® (octafluoropropane [perflutren] with a lipid shell) Lantheus Medical, Billerica, MA, USA, introduced in 2001. Licensed in Canada and Australia. Sonazoid® (perfluorobutane with a phospholipid shell: hydrogenated egg phosphatidyl serine). Daiichi-Sankyo, GE Tokyo, Japan, introduced in 2007. Licensed in Japan and now South Korea. There are several other UCA which may be useful in liver studies but they are either not licensed for the liver in any country or, in the case of Levovist® (Bayer Schering AG, Germany), production has ceased. For product information regarding handling, composition, packaging, storage, indications and contraindications of these agents, contact the manufacturing company. UCA strongly increase the backscatter of US regardless of whether the microbubbles are flowing or stationary. The low solubility of the gases in currently licensed UCA improves their stability and provides good resonance behavior at low acoustic pressures. This allows minimally disruptive contrast-specific imaging and enables effective investigation over several minutes to visualize their dynamic enhancement patterns in real time. Because of their physical size (equal to or smaller than red blood cells), UCA act as blood pool agents and allow depiction of both the macrovasculature and the microvasculature . Despite their varied physicochemical composition, all UCA have similar behaviors for CEUS imaging, rapidly enhancing the vascular pool after intravenous injection, with slow dissipation over about 5 min. An exception to this behavior occurs with Sonazoid®, which has an extended late phase, herein termed the “postvascular phase” in which it persists for several hours in the liver and spleen, long after it has disappeared from the detectable vascular pool. Sonazoid® is phagocytozed by Kupffer cells and this undoubtedly contributes to its persistence in the liver. This postvascular phase is often referred to as “the Kupffer phase” . Stable nonlinear oscillations at low acoustic pressure, which is nowadays the standard modality for most CEUS examinations. Disruption at higher acoustic pressures to give broadband nonlinear responses. Nonlinear harmonic US signals also arise from tissue because the sound waves become distorted during their propagation. These “tissues harmonics” increase with increasing acoustic pressure, which is roughly indicated by the mechanical index (MI), (see section 1.8)    . However, a low MI is usually chosen for continuous real-time imaging, and for minimizing microbubble destruction. MI is considered as “low” when ≤ 0.3 but most systems work optimally with MI far below 0.3 (as low as 0.05). Current contrast specific imaging enables effective tissue cancellation to generate almost pure microbubble images. Each manufacturer has developed proprietary techniques for this and adequate cancellation is indicated by near-disappearance of the ultrasound parenchymal liver structures (the screen goes black), though strong reflectors, such as vascular structures and the diaphragm/lung interface, remain barely visible. Correct settings on the ultrasound scanner and the scanning mode are important to avoid artifacts . Inappropriately high MI and gain are the two most common causes of tissue signals being wrongly displayed. For characterization of FLL, the enhancement patterns observed during the arterial, portal venous and late phases are generally similar among CEUS, CECT and CEMRI. The real-time nature of US allows depiction of early arterial phase enhancement which is sometimes missed on CT and MRI because they have lower frame rates. Discordance has also been shown in some lesions during the portal venous and late phases when CT and MRI contrast materials diffuse into the tumor interstitium and may conceal wash out . On the other hand, postvascular phase imaging with Sonazoid® shows patterns similar to those described with superparamagnetic iron oxide (SPIO)-MRI . See companies’ websites for references and specification. Investigators wishing to perform CEUS examinations are recommended to gain experience by observing contrast studies being performed by experts in this field. EFSUMB has defined three levels of training in its minimal training requirements (EFSUMB 2006)  and recommends that CEUS should be performed by operators at a competence level higher than level 1 (EFSUMB 2010: Appendix 14) . They should also ensure that their equipment is optimized for CEUS by discussion with their equipment manufacturer. In addition, a sufficient volume and variety of pathology are essential to acquire and maintain an adequate level of skill. Practitioners need competence in the intravenous administration of contrast agents, familiarity with any contraindications and ability to deal with any possible adverse effects within the medical and legal framework of their country. In general, UCA are safe with a very low incidence of side effects. There are no cardio-, hepato- or nephrotoxic effects. Therefore, it is not necessary to perform laboratory tests to assess liver or kidney function before their administration. The incidence of severe hypersensitivity events is lower than with current X-ray contrast agents and is comparable to those encountered with MRI contrast agents. Life-threatening anaphylactoid reactions in abdominal applications have been reported with a rate of 0.001 %, with no deaths in a series of > 23 000 patients . Nonetheless, investigators should be trained in resuscitation and have the appropriate facilities available. Deaths in critically ill patients who have undergone contrast echocardiography examinations have been reported but with no evidence of a causal relationship . Contraindications for the use of SonoVue® were defined by the European Medicines Agency (EMA) in 2004. In 2007, the United States of America Food and Drug Administration (US-FDA) issued contraindications for the use of Definity® and Optison® (GE Healthcare, licensed for cardiac use) in patients with severe cardiopulmonary disease, and imposed echocardiogram (ECG) monitoring for 30 min after injection (US-FDA Alert 10/2007). The contraindications were downgraded to warnings in May 2008 following review of recent studies on contrast reactions and postmarketing studies supplied by the manufacturers at the request of the FDA ; in 2011, the requirement to observe the patient for 30 min after injection was removed. Numerous subsequent studies have been conducted to examine adverse reactions to UCA in cardiac applications  and these have indicated an excellent safety profile. One study  demonstrated the positive impact of the use of UCA in cardiac examinations: additional procedures were avoided or therapy changed in over 35 % of patients. Another large study reported better survival in acute cardiac disorders undergoing UCA administration in comparison to those receiving echocardiography without UCA . Although there is a theoretical possibility that the interaction of diagnostic ultrasound and UCA could produce bioeffects, there is no clinical evidence for adverse effects on the human liver. Cellular effects that have been observed in vitro include sonoporation, hemolysis and cell death . Data from small animal models suggest that microvascular disruption can occur when microbubbles are insonated . Thus, in general, low MI should be preferred for CEUS of the liver. Where diagnostic information can only be obtained using high MI sequences, the benefits vs. the risks of the procedure should be assessed and the mode selected for the benefit of the patient. There is limited data on the use of UCA in pregnancy, during breastfeeding or in pediatrics . The implied contraindications can be overridden according to clinical judgment and with dedicated informed consent in case of need. All administration decisions and procedures for the use of UCA should be made with the local regulatory restrictions in mind. As in all diagnostic ultrasound procedures, the operator should be mindful of the desirability of keeping the displayed MI low and of avoiding unduly long exposure times. Caution should be exercised when using UCA in patients with severe coronary artery disease. As with all contrast agents, resuscitation facilities must be available. The use of UCA should be avoided 24 h prior to extracorporeal shock wave therapy. The appearance of a lesion or region-of-interest in the liver should be described in terms of the degree and timing (phase) of enhancement. Degree of enhancement: describing the region in terms of vascularity (e. g., hypervascular, hypovascular) may be incorrect from a histologic point of view and describing the degree of enhancement is preferred. Enhancement refers to the intensity of the signal relative to that of the adjacent parenchyma: either equal to, isoenhancing; greater than, hyperenhancing; or less than, hypoenhancing. Sustained enhancement usually refers to continuance of enhancement in the lesion over time. Complete absence of enhancement can be described as nonenhancing. When a region is nonenhancing in the postvascular phase with Sonazoid®, the term “enhancement defect” is often used in clinical practice. The enhancement pattern should be described separately for the different phases, which for the liver comprise the arterial, the portal venous, the late phases and, in case of Sonazoid®, also the postvascular phase. Conventional, but imprecise time points, separate these different phases (see section 2.1.1). “Wash in” used for both qualitative and quantitative analysis, refers to the period of progressive enhancement within a region of interest from the arrival of microbubbles in the field of view to “peak enhancement” and “wash out phase” refers to the period of reduction in enhancement which follows peak enhancement. 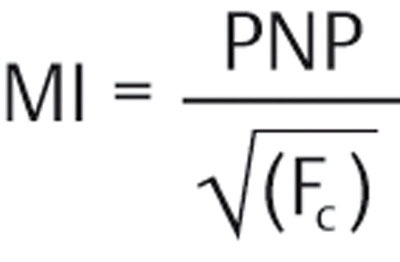 where PNP is the peak negative pressure of the ultrasound wave (in MPa and derated for modeled attenuation) and Fc is the center frequency of the ultrasound wave (MHz). RF data refers to the radiofrequency information after the beam former. Raw data refers to the data after the phase information in the RF data has been removed. Linear data refers to the RF or Raw data, before compression. Video data refers to the data after log (or quasi log) compression for video display. CEUS should be performed with knowledge of all prior imaging, the patient’s demographics and the clinical history, exactly as for a conventional ultrasound examination. This is particularly important for lesion characterization because the range of tumor types differs between cirrhotic and noncirrhotic livers. 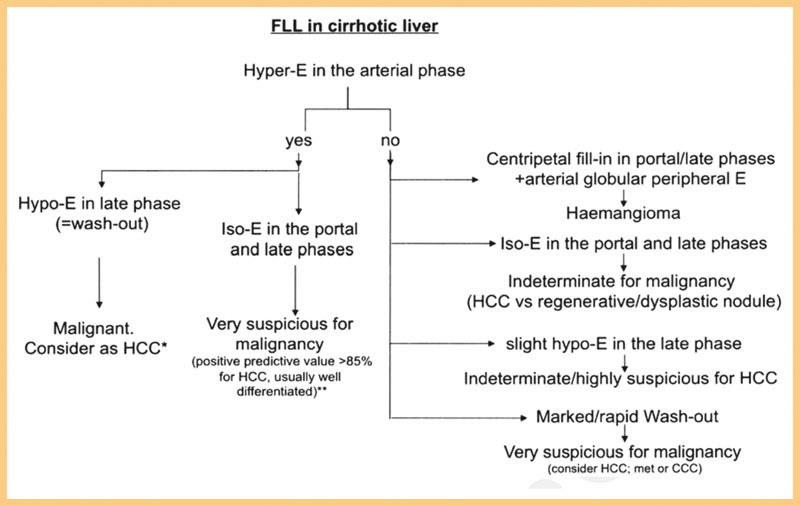 Accordingly, in these guidelines the characterization of FLL is described separately for patients with and without cirrhosis. Vascular phases in CEUS of the liver (visualization postinjection time). The portal and late phases start at the end of the preceding one. Individual hemodynamic and other factors (e. g., site of injection) may influence their time of onset. The arterial phase provides information on the degree and pattern of the arterial vascular supply. Depending on the individual’s circulatory status, the hepatic arterial phase generally starts within 20 s after injection and continues to 30 – 45 s. This phase may occur very rapidly and the real-time nature of CEUS is needed to capture them, often best seen in a slow replay of a stored cine loop. The portal venous phase usually lasts until 2 min after injection. These two early phases are very similar between the different available UCA (SonoVue®, Definity®, Sonazoid®). The late phase lasts until the clearance of the UCA from the circulation and is limited to 4 – 6 min. The additional postvascular (or Kupffer) phase for Sonazoid® begins 10 min after injection and lasts for an hour or more. To ensure that there is no overlap with the late phase, postvascular phase scanning should not be performed sooner than 10 min after injection. All of these times may be shortened by microbubble disruption if the liver is imaged continuously, even at a low MI. Late and postvascular phase enhancement provide important information regarding the character of a lesion as most malignant lesions are hypoenhancing while the majority of solid benign lesions are iso- or hyperenhancing       . Any investigation should start with conventional B-mode and Doppler techniques. After identification of the target lesion, the transducer is held still while the scanner is switched to low MI contrast-specific imaging. A dual screen format showing a low MI B-mode image alongside the contrast-only display aids anatomic guidance. This is useful for small lesions to ensure that the target is kept within the field of view during CEUS. A difficulty with the split screen method is that a low MI is used for both panels and this means that the gray scale display is noisy so that smaller and low contrast lesions may be difficult to image. On some scanners, conventional and CEUS images are not split onto two screens but overlaid with different color scales. UCA is administered as a bolus injection followed by a flush of normal saline 0.9 %. Ideally, the diameter of the venous line should not be smaller than 20 G to avoid destruction of microbubbles during injection. Central line and port systems can be used as long as there is no filter requiring a high injection pressure but contrast arrival time will be shorter. A stop clock should be started at the time of UCA injection. Because of the dynamic nature of real-time CEUS, essential clips for each vascular phase should be recorded. Assessment of the arterial and portal venous phases should be carried out without interruption. For the late phase, intermittent scanning may be used until the disappearance of the UCA from the liver’s microvasculature. Under some circumstances, especially for HCC, the examination may need to be continued for up to 5 min because wash out may be delayed . Injection can be repeated when a lesion has been detected in the portal venous phase or in the late/postvascular phase to study the arterial phase and in the case of multiple FLL. Reinjection should be postponed until most microbubbles have vanished and the CEUS screen is almost black again, which can be expected after 6 – 10 min using SonoVue® and Definity®. CEUS can often establish a definitive diagnosis or otherwise facilitate the clinical decision as to whether a sonographically detected liver lesion needs further investigation. Sustained enhancement in the portal and late phases is typically observed in almost all solid benign liver lesions. They can be further characterized by their enhancement patterns during the arterial phase, (e. g., enhancement of the whole lesion [typical of focal nodular hyperplasia] or initial peripheral globular/nodular enhancement [in hemangiomas]). The enhancement patterns are summarized in [ Table 2 ]. Enhancement patterns of benign focal liver lesions in the non cirrhotic and cirrhotic liver. In cirrhotic liver simple cysts, hemangiomas and abscesses may also be found and show the same enhancement pattern as in noncirrhotic livers. All other entities are rare findings in cirrhotic livers. CEUS has markedly improved the accurate diagnosis of hemangiomas, which is now possible in about 95 % of cases . The typical CEUS features of a hemangioma are peripheral nodular enhancement in the arterial phase, progressing in a centripetal direction to partial or complete fill-in. The filling lasts from seconds to minutes and is more rapid in smaller lesions. Enhancement is sustained through the late and postvascular phases. High flow (or shunt) hemangiomas show rapid homogeneous hyperenhancement in the arterial phase and can be confused with focal nodular hyperplasia (FNH), or rarely with hepatocellular adenomas or carcinomas. Thrombosed hemangiomas can be confused with malignancies because of the lack of enhancement in the thrombosed portions, which may be misinterpreted as wash out . FNH is a benign hepatic lesion that is usually discovered incidentally. It can be managed conservatively in most patients. Color Doppler techniques are helpful to visualize the spoke-wheel vascular pattern which strongly supports the diagnosis of FNH   more sensitively shown on CEUS, especially with maximum intensity projection (MIP) technique. On CEUS, FNH typically appears as a hyperenhancing homogeneous lesion in all phases. Hyperenhancement is obvious and usually marked in the arterial phase, with a rapid fill-in from the center outwards (70 %) or with an eccentric vascular supply (30 %) . During the portal venous and late phases, FNH may remain slightly hyperenhancing or become isoenhancing  and a centrally located scar may be seen, hypoenhancing in the late phase. In small or deeply located lesions, it can be helpful to switch to color Doppler techniques after the CEUS study and use the remaining circulating microbubbles to enhance the Doppler signals for improved recognition of the typical spoke-wheel vascular pattern. Postvascular phase imaging (Sonazoid®) shows iso- or hyperenhancement . Hepatocellular adenoma (HCA) is a benign estrogen-dependent tumor, which is often discovered incidentally . HCA is an indication for surgery, particularly when larger than 5 cm (risk of hemorrhage and possible malignant transformation). On CEUS, HCA exhibit arterial hyperenhancement, usually initially at the periphery with subsequent very rapid centripetal filling, the opposite direction to that seen in FNH. However, this arterial enhancement pattern can also be encountered in HCC and hyperenhancing metastases and is not pathognomonic of HCA. The transition from the arterial hyperenhancing to the isoenhancing appearance occurs at the beginning of the portal venous phase, usually earlier than in FNH  . In most cases, the enhancement patterns of HCA may suggest malignancy when wash out occurs in the late phase, one of the few causes of false positives on CEUS. Focal fatty change, either fat infiltration or fatty sparing, may simulate masses on conventional B-mode US. Differential diagnosis is important, especially in patients with underlying malignant disease or with an atypical location of suspected focal fatty changes. Focal fatty change shows exactly the same enhancement patterns as the adjacent liver parenchyma in all phases . Phlegmonous inflammation has variable and sometimes confusing CEUS appearances, which change as they evolve, early lesions being hyperenhancing, while mature lesions develop hypoenhancing foci as liquefaction progresses. Mature abscesses typically show marginal enhancement in the arterial phase, sometimes with enhancement of septae followed by venous hypoenhancement. Lack of enhancement in the liquefied portions is the most prominent feature   . The appearances of granulomas and focal tuberculosis on CEUS are variable but the majority show peripheral enhancement in the arterial phase with wash out in the portal and late phases, which may be difficult or impossible to differentiate from malignancies. The clinical history is important and the diagnosis is usually obtained on histopathology or microbiology  . Active hemorrhage demonstrates contrast extravasation whereas hematomas show no enhancement. Cysts show no contrast enhancement at all. CEUS is not needed for simple cysts but is useful to evaluate complicated or atypical cysts. Inflammatory pseudotumor is a rare disease whose definite diagnosis is usually only made at surgery. It may show arterial enhancement and late phase hypoenhancement, falsely suggesting malignancy . Hepatic angiomyolipoma is a rare benign mesenchymal tumor with heterogeneous echogenicity on baseline ultrasound. CEUS shows arterial hyperenhancement . Cholangiocellular adenomas (CCA or bile duct adenoma) are rare lesions that are usually small (90 % < 1 cm). CEUS may show strong arterial enhancement and early wash out in the portal and late phases (they lack portal veins), falsely suggesting malignancy . Hypoenhancement of solid lesions in the late and postvascular phases, corresponding to the wash out phenomenon characterizes malignancies. Almost all metastases show this feature, regardless of their enhancement pattern in the arterial phase. Very few exceptions to this rule have been reported, mainly in atypical HCC ([ Table 3 ]). Enhancement patterns of malignant focal liver lesions in the noncirrhotic and cirrhotic liver. Explanation: Other malignancies in cirrhosis have the same patterns as in noncirrhotic livers. HCC are usually hyperenhancing in the arterial phase, typically with a chaotic vascular pattern. In the portal venous and late phases, HCC usually shows hypoenhancement apart from well-differentiated HCC that may be isoenhancing. Hyperenhancement in the arterial phase is believed to be homogeneous with fill from the periphery. However, this information is based only on expert opinion. The fibrolamellar variant of HCC has nonspecific appearances on B-mode. According to expert opinion and a single case report, they show rapid hyperenhancement with a heterogeneous pattern in the arterial phase and rapid wash out . Intrahepatic cholangiocarcinomas have a variety of patterns in the arterial phase but all show late phase wash out, in contrast to the late enhancement on CECT or CEMRI   . The typical pattern of malignancy is better displayed by CEUS than by CECT or CEMRI. Peripheral cholangiocarcinoma may also be suspected on baseline US as surface retraction is a characteristic feature. Liver metastases can be detected and characterized reliably as hypoenhancing lesions during the portal venous and late phases, with very few exceptions. Wash out starts early, usually in the portal venous phase, and is marked. Thus, they appear as punched-out “black foci” against the background of the uniformly enhanced normal liver. Larger traversing vessels can sometimes be seen as enhancing lines within the lesion but these are not tumor tissue and, thus, have the hemodynamics of the vascular tree, disappearing in parallel with the main liver vessels rather than being retained, as occurs in the normal liver parenchyma. In the late phase, very small metastases may be conspicuous and lesions that were occult on B-mode ultrasound can be detected . Metastases usually show at least some contrast enhancement in the arterial phase and sometimes this is marked and often it is chaotic. Rim or halo enhancement is often seen. Only a few false positive results have been observed, mainly from abscesses or necrosis, old fibrous FNH, granulomas and inflammatory pseudotumors   . Benign lesions such as cysts, calcifications, hemangiomas, FNH and adenomas are found with the same frequency (5 – 20 %) in the metastatic liver as in a healthy population. Thus, the possibility of a benign FLL must be kept in mind when the liver is first staged after the diagnosis of a cancer, especially with lesions < 2 cm. Lymphoma shows variable arterial enhancement but characteristic wash out in the portal venous and late phases, predictive of malignancy . CEUS should be performed and interpreted with knowledge of the patient’s clinical history and investigations findings. When the enhancement patterns are typical (in appropriate clinical settings) hemangiomas, FNH, focal fatty change and malignancies can all be characterized with confidence. FLL with atypical enhancement patterns or studies that are technically suboptimal require further investigation, mainly with CECT and/or CEMRI. Incidental findings on routine ultrasound. Lesion(s) or suspected lesion(s) detected with US in patients with a known history of a malignancy, as an alternative to CT or MRI. Need for a contrast study when CT and MRI contrast are contraindicated. Specificity and sensitivity are reduced in moderately or markedly fatty livers and with deeply positioned lesions. The FLL that occur in the cirrhotic liver are hepatocellular lesions (> 95 % of cases), peripheral cholangiocellular carcinomas (CCC), lymphomas and hemangiomas. Other diagnoses may be considered, but they are very rare, for unknown reasons. B-mode ultrasound may detect features of malignancy (such as infiltration of adjacent structures, including vessels) but these features are usually only seen in large nodules (> 5 cm) and do not help characterize smaller nodules. Low- or high-grade dysplastic nodule. Dysplastic nodule with a focus of HCC. Moderately to poorly differentiated HCC. Progression along this pathway is accompanied by a decrease in both normal arterial and portal blood flow and a concurrent disappearance of normal intranodular vessels . Simultaneous with this decline in normal vascularity, there is a progressive increase in arterial flow from newly formed tumor vessels (neoangiogenesis). Therefore, hyperenhancement in the arterial phase can be seen in HCC of all stages of differentiation . These changes are key elements for the characterization of hepatocellular nodules in cirrhosis during the vascular phases of contrast enhancement. Beside the vascular changes, HCC nodules tend to be devoid of reticuloendothelial cells (Kupffer cells), particularly with progressive dedifferentiation from well to moderately and poorly differentiated grades. This has become of particular importance with the introduction of contrast agents with a postvascular phase, where HCC shows as an enhancement defect. The probability of HCC increases with nodule size. Nodules < 1 cm are rarely malignant and ultrasound follow up (at 3-month intervals) is sufficient, according to the AASLD guidelines . Further investigations should be started when the nodule enlarges to over 1 cm. The rate of HCC is 66 % in nodules 1 – 2 cm  , increasing to about 80 % in nodules of 2 – 3 cm in size  and is above 92 – 95 % for nodules larger than 3 cm. The most challenging situation for imaging techniques is, therefore, the diagnosis of nodules of 1 – 3 cm in diameter. General recommendations for the study of FLL are summarized above (see section 2.1.2). In addition, if the liver is cirrhotic, the following points should be kept in mind. Since the arterial phase is the most important in the setting of cirrhosis, good visualization of the nodule during normal breathing is desirable. If this is impossible, it is important to practice cooperation with the patient so that the nodule can be visualized during a breath hold, best taken about 10 s after contrast injection and maintained for 15 – 30 s.
As microbubbles are disrupted despite the use of a low mechanical index, acoustic output power should be reduced as much as possible, while maintaining sufficient signal intensity, to allow contrast persistence until the very late phase (beyond 3 – 4 min), which is often critical for the diagnosis of HCC. Furthermore, when the arterial phase is over, the lesion should be scanned intermittently, not continuously, to minimize bubble disruption that may cause difficulties in interpretation of subtle wash out. The key feature for the diagnosis of HCC in liver cirrhosis is hyperenhancement in the arterial phase, followed by wash out in the late phase . This pattern corresponds to HCC in more than 97 % of cases    . However, it has also been reported in peripheral CCC and hepatic lymphoma, which comprise the remaining 1 – 3 % of cases. The timing and intensity of wash out in the latter lesions have not yet been described precisely    . Arterial hyperenhancement is usually homogeneous and intense in HCC, but may be inhomogeneous in larger nodules (> 5 cm), which contain regions of necrosis. Rim enhancement is atypical for HCC. Wash out is observed overall in about half the cases of HCC but more rarely in very small nodules (20 – 30 % in those 1 – 2 cm, 40 – 60 % in those 2 – 3 cm)   . Wash out is observed more frequently in HCC with poorer grades of differentiation than in well-differentiated HCC, which tend to be isoechoic in the late phase    . The hypoenhancement in the late phase is usually less marked in HCC than in other primary tumors or in liver metastases. Furthermore, the wash out tends to start later in HCC, usually not before 60 s after injection and, in up to 25 % of cases, appearing only after 180 s  ; consequently it is important to observe nodules in cirrhosis until very late (> 4 min) to increase sensitivity for the diagnosis of HCC. Early wash out (< 60 s) has been reported to occur in poorly differentiated HCC or to suggest a nonhepatocellular malignancy    , most often a peripheral CCC. Wash out in HCC is observed less often with CEUS compared with MRI or CT because of their different contrast pharmacokinetics    . Arterial hyperenhancement not followed by wash out is also highly suspicious for HCC, mainly for the well-differentiated variants but is not definitive     . An inconclusive CEUS pattern does not rule out malignancy and should prompt other imaging (CT or MRI) and, if these are also inconclusive, biopsy is needed. If this is negative, the nodule should be followed up every 3 months (at least for the first 2 years) and, if it enlarges or the enhancement pattern changes, diagnostic investigations must be resumed. If arterial enhancement is present on any imaging technique, repeated biopsy should be considered even in the absence of changes in size or enhancement. Hemangioma has the same CEUS pattern in cirrhosis as in the noncirrhotic liver but an additional MRI scan is preferable to confirm the diagnosis in this clinical setting. Abscesses may occur in cirrhosis, usually as a complication of interventional procedures. CEUS shows typical findings of malignancy in CCC, whereas the enhancement pattern at MRI and CT may be inconclusive . Examining the entire liver during the arterial phase to look for hyperenhancing nodules is difficult or impossible with CEUS, so CECT or CEMRI must be used to stage patients with HCC . For Sonazoid®, the postvascular phase may improve staging of the disease. A diagnostic flowchart for CEUS of nodules in cirrhosis is given in [ Fig. 1 ]. Fig. 1 *In cases with marked and rapid wash out in portal/late phase, consider the possibility of peripheral cholangiocarcinoma, especially if the pattern with MRI or CT does not confirm late wash out, or (exceptionally) metastasis or lymphoma. CEUS alone with a typical pattern is enough to establish a diagnosis of malignancy in nodules > 1 cm, but a panoramic imaging technique (CT or MRI) is required to stage the patient before treatment. **When Sonazoid is used, the postvascular phase may allow diagnosis of malignancy if the lesion becomes hypoenhancing in the postvascular phase, even though it appeared isoenhancing in the portal/late phases. E = enhancement; HCC = hepatocellular carcinoma; CCC = cholangiocellular carcinoma; met = metastasis. To characterize all nodules found on surveillance and routine US. To characterize nodules in cirrhosis and establish a diagnosis of HCC. It is a strong belief of the expert panel that CEUS is extremely useful, especially when performed immediately after nodule detection, to make a rapid diagnosis. However, CT or MRI are needed (unless contraindicated) to stage the disease before the treatment strategy is decided. Whether CEUS has a role as first line investigation at the same level as CT or MRI is variably accepted in national and international guidelines. For example, CEUS is part of the Japanese guidelines on HCC   but has been removed from the American guidelines . This was partly justified by the fact that no UCA is licensed for the liver in the USA and additionally because of the risk of misdiagnosing CCC for HCC when CEUS is used alone (1 – 2 %). In practice, the likelihood of misdiagnosis is minimal when CEUS is performed by skilled operators . When CT or MRI is inconclusive, especially in nodules not suitable for biopsy. To contribute to the selection of nodule(s) for biopsy when they are multiple or have different contrast patterns. To monitor changes in size and enhancement patterns over time when a nodule is not diagnostic for HCC and is being followed. Sonazoid® is different from pure blood-pool ultrasound contrast agents in that, in addition to the arterial and portal venous phases, there is a postvascular phase starting from 10 minutes after injection. Sonazoid® is taken up by the reticuloendothelial cells, particularly the Kupffer cells, similarly to SPIO MRI contrast agents . The microbubbles can be detected even when located within cells. The mesenchymal meshwork of malignant lesions usually does not harbor reticuloendothelial (Kupffer) cells, at variance from normal and cirrhotic liver parenchyma and from most solid benign liver lesions. The absence of Kupffer cells causes a defect in Sonazoid® uptake in the postvascular phase  , which is, thus, a molecular imaging modality. The diagnostic capability of CEUS with Sonazoid® in the postvascular phase is similar to that of MRI with an SPIO  and has been endorsed in the Japanese guidelines for the management of HCC . After intravenous injection of Sonazoid®, continuous scanning for 30 – 60 s is recommended to assess the arterial and portal venous phases. The late vascular phase is deemed less relevant by Japanese authors, as this is replaced by the postvascular phase. For assessment of the postvascular (Kupffer) phase, scanning is begun not earlier than 10 min postinjection of Sonazoid® to allow clearance of contrast from the blood pool . After the end of the portal venous phase, insonation of the liver should be stopped to limit acoustic disruption of microbubbles before the postvascular phase. The postvascular phase lasts until the microbubbles have disappeared; thus, there is usually enough time for a thorough assessment of the whole liver to detect enhancement defects that suggest malignant nodules. When an enhancement defect is identified in the postvascular phase, a repeat contrast injection can be performed, superimposed on the original enhancement, to assess the arterial phase in this region. This procedure is termed “defect reperfusion imaging” or “defect reinjection technique” . Image interpretation in the postvascular phase with Sonazoid® is reported in [ Table 4 ]. A contrast defect, corresponding to hypoenhancement in the postvascular phase should be regarded as highly suggestive of malignancy in the setting of nodules in cirrhosis . Very well differentiated, early HCC, are isoenhancing in both the arterial and the postvascular phases in approximately 70 % of cases . Nodule characterization cannot be performed in the postvascular phase alone, for which arterial phase assessment remains the cornerstone. Enhancement patterns of focal liver lesions in liver cirrhosis during the postvascular phase (Kupffer phase) with Sonazoid®. The arterial and portal venous phases are the same as for other agents. Cholangiocarcinoma may mimic metastasis and poorly differentiated HCC. Metastasis may mimic cholangiocarcinoma and poorly differentiated HCC. To characterize nodules in cirrhosis, allowing assessment of both the vascular and postvascular phases. CEUS has been adopted in the Japanese guidelines for the management of HCC    to search for nodules seen on CT or MRI but unidentifiable on B-mode ultrasound. To screen for HCC in a cirrhotic liver ; however, there is no evidence to date that this procedure is cost-effective. To stage HCC in livers in which US imaging is satisfactory; however, there is no evidence to date that CEUS can replace CT or MRI. When a nodule is deeply located (> 8 cm) and suboptimally visualized with conventional B-mode ultrasound, its evaluation can become even worse during CEUS because of attenuation by contrast microbubbles. Use of greater amounts of contrast increases the signals both from nodules and from superficial tissues, usually failing to improve or even worsening target evaluation. Irrespective of the contrast agent used, high doses should be avoided because this limits CEUS penetration in all phases. When the liver parenchyma is coarse on B-mode ultrasound, it may be extremely difficult to detect small nodules making it difficult to choose the region to be scanned during CEUS in the arterial phase. In case of liver nodules in patients with complete portal thrombosis, perfusion of the parenchyma depends on the arterial supply. Reducing the contrast dose (half the usual dose or less) can reduce signal saturation and improve tumor conspicuity. Bland (appositional) thrombosis refers to the presence of a simple clot within the vein. It is often silent and may be clinically inapparent. Malignant (neoplastic) thrombosis occurs almost always as a complication of HCC in the liver. Its identification is of prognostic significance as it negatively alters therapy options and upstages disease. The thrombosed portal vein may look normal and yet be filled with thrombus. However, more often the thrombus has variable echogenicity, making the lumen appear hypoechoic rather than anechoic. The baseline scan should include color and spectral Doppler interrogation of the portal veins. Complete thrombosis shows no detectable signal from the portal vein, even when optimized for slow flow. The presence of intrathrombus signal with an arterial waveform on Doppler spectral examination is a highly specific sign of malignancy but its sensitivity is only moderate. Bland thrombus is avascular and shows as a void within the enhancing liver in all phases of CEUS but best visualized during the portal venous phase. A malignant thrombus has the same enhancement characteristics as the tumor from which it originated, including rapid arterial phase hyperenhancement   . While slow and weak portal venous wash out may be seen, the wash out is usually more rapid. To perform the scans, the suspect thrombus within the vein should be studied during the wash in of the UCA, as the vascularization of the clot should parallel the arrival of the microbubbles within the hepatic artery in the liver in case of neoplastic thrombus. Sweeping through the liver in sagittal and axial planes in the portal venous phase will often depict the washed out tumor within the portal vein branches optimally. The tumor source of a malignant portal vein thrombus may be obvious or it may be invisible on ultrasound, even with the assistance of CEUS. Sweeping through the liver in both the arterial and the portal venous phases of enhancement may be enlightening. Washed out regions of the liver should undergo reinjection with arterial phase imaging to show their arterial enhancement. A suspicious clot within the portal vein may be amenable to biopsy with US guidance, targeting, whenever possible, enhancing regions within the thrombus . CEUS prior to biopsy procedures can increase the diagnostic yield by 10 % and decrease the false negative rate especially in large tumors with areas of necrosis. CEUS can localize the site for biopsy more accurately by demonstrating regions of vascularized viable tumor, which should be targeted, and regions of necrosis, which should be avoided . These two entities cannot be distinguished by conventional ultrasound alone. CEUS may also locate occult lesions on nonenhanced US . Conventional US is the most frequently used modality for the primary imaging of abdominal organs, including the liver but is less sensitive in the detection of liver lesions than CECT, CEMRI or intraoperative US. The main reasons for this are difficulties in detecting small and isoechoic lesions, especially when they are deep or in difficult anatomic locations. The published literature         provides strong evidence that CEUS significantly improves the detection of metastases compared with conventional US. The most important CEUS feature for detecting a malignant liver lesion is the identification of a focal region of wash out occurring as early as the late arterial phase but mostly during the portal venous and late or postvascular phases. With all agents, lesion detection requires an examination time of at least 3 – 4 min, which is the useful persistence of most microbubbles. With agents presenting a postvascular phase (Sonazoid®), it is possible to detect lesions that wash out very late  . A second administration (reinjection technique) can be used to confirm the metastatic nature of any detected contrast defect by demonstrating arterial enhancement followed by wash out (see section 2.2.6). The typical and almost invariable appearance of metastases is focal hypoenhancement in the portal venous, late and postvascular phases. The enhancement patterns observed during the arterial phase are variable and help to characterize lesions but aid only minimally in their detection (see section 2.1.3). With vascular phase agents (SonoVue®, Definity®), several studies have shown that the accuracy in the detection of liver metastases is comparable to that of CECT and CEMRI, when scanning conditions allow a complete investigation of all liver segments . With all agents (SonoVue®, Definity®, Sonazoid®), most HCC show increased enhancement in the arterial phase but the short duration of this phase makes adequate assessment of the whole liver impossible, at least with current technology. The late phase lasts long enough for thorough exploration, but the appearances of HCC are variable, as described in section 2.2.3, and, importantly, not all HCC wash out in the late phase, limiting the sensitivity of CEUS for the detection of HCC. Consequently, routine use of UCA in the detection of HCC with vascular phase agents cannot be recommended. With agents presenting a postvascular phase (Sonazoid®), scanning the entire liver at 10 min or later after injection helps to detect malignant nodules since typical HCC show as an enhancement defect   . However, postvascular defects are not specific findings and demonstration of homogeneous arterial enhancement requires a second administration of Sonazoid® to confirm the diagnosis of HCC. Moreover, approximately half of well differentiated HCC do not show enhancement defects in the postvascular phase . Depiction of local tumor recurrence and residual tumor after ablation using B-mode alone is difficult. With vascular phase agents, scanning in the arterial phase with repeated injections demonstrates the hypervascularity in the recurrence, which usually lies adjacent to the previously ablated tumor. The same technique is useful for demonstrating new HCC and, in both cases, helps identify the target and guide treatment (see section 5.1). Cholangiocarcinomas behave in the same way as metastases, washing out rapidly and appearing as defects in the late phase, regardless of the appearance in the arterial phase . This pattern may facilitate detection of satellite nodules adjacent to a larger lesion that were not visualized on conventional US. To characterize indeterminate (usually small) lesions shown on either CECT or CEMRI. To “rule out” liver metastases or abscesses, unless conventional ultrasound shows typical findings. For treatment planning in selected cases to assess the number and location of liver metastases, either alone or as complementary to CECT and/or CEMRI. Surveillance of oncology patients where CEUS has been useful previously. Recommended to replace unenhanced US with CEUS for the evaluation of liver metastases in colorectal cancer after chemotherapy . CEUS with vascular phase agents is not indicated for the detection and staging of HCC. With the use of Sonazoid® and postvascular phase scanning, CEUS may be used to stage HCC in the liver where imaging is good. However, there is no evidence to date that CEUS can replace CT or MRI. A potential pitfall is that small cysts, which were not seen on unenhanced US, are sometimes detected in late or postvascular phase scanning. Careful re-evaluation with conventional US may help to show their cystic nature. In doubtful situations, a second contrast agent injection is recommended, looking for arterial phase enhancement, which indicates viable tumor tissue. Standard preoperative imaging remains limited in selecting patients who may benefit from liver surgery  . Intraoperative ultrasound (IOUS) is recognized as the gold standard, which ultimately dictates the surgical management of those undergoing resection    . Patients with early stage HCC are offered transplantation or resection , which can be curative procedures. Similarly, for patients with colorectal liver metastases, resection is the treatment of choice, with 5-year survival rates of up to 60 %  . However, 75 % of patients who undergo resection develop recurrences (50 % in the liver). The majority of recurrences appear within 2 years   . Thus, more accurate imaging is required. Recent studies of intraoperative contrast enhanced ultrasound (IO-CEUS) with different contrast agents have shown that it is more sensitive, specific and accurate than IOUS, CT or MRI in defining whether tumor resection (metastases or HCC) is appropriate. Furthermore, surgical management is altered in up to 30 % of cases      . It is now recognized that the more aggressive the surgical approach adopted, the higher the impact of IO-CEUS becomes . Dedicated high frequency intraoperative probes with contrast specific capability are needed. Covering the transducer and cable with a long sterile sheath containing coupling gel, and the control panel with a large sterile membrane ensures sterility. Some ultrasound systems provide intraoperative transducers that can be sterilized by gas and, thus, need no cover. At surgery, all patients undergo a manual abdominal and pelvic exploration for extra-hepatic disease followed by mobilization of the liver from the diaphragm to improve sonographic access. Bimanual palpation of the liver is then performed, followed by systematic IOUS of the entire liver, looking for previously diagnosed as well as for new lesions and to identify involvement of major vessels or bile ducts. With vascular phase agents (SonoVue® and Definity®) CEUS is used as explained for the transabdominal approach (see section 2.1.2). The duration of enhancement in normal liver in the late phase is shorter than with percutaneous US. Injections may be repeated for global assessment, or to assess the arterial phase enhancement of identified lesions for their characterization. Irrespective of the contrast agent used, high doses should be avoided because this limits US penetration in all phases. With postvascular phase agents (Sonazoid®), detection of malignant FLL starts 10 min postinjection  . A second injection can be used to confirm the metastatic nature of a lesion by demonstrating arterial enhancement (see section 2.1.6). Image interpretation is the same as for the transabdominal approach reported in section 2.1.5. The detection of liver metastases in all patients undergoing liver resection. The characterization of focal liver nodules in cirrhotic patients undergoing liver resection for HCC, especially of new nodules detected at IOUS . The targeting of occult lesions for ablation therapy for patients undergoing combined liver resection and ablative therapy. The shorter duration of contrast enhancement is a limitation of IO-CEUS. Locoregional therapies, which conventionally include ablation, whatever the modality used, and transarterial chemo/radioembolization, play a key role in the management of patients with liver malignancies, both HCC and metastases  . Unenhanced US is commonly used to guide ablation. It is easy to use and widely available but, even when combined with Doppler, it does not provide useful information on the extent of the ablation. Assessment of tissue perfusion is crucial to differentiate necrotic from viable residual tumor. Assessment of the lesions to be treated by ablation (number and size and homogeneity of enhancement of the lesions, and the presence of feeding vessels) to define the eligibility of the patient for treatment and the best ablation strategy. Depict previously undetectable lesions with the support of fusion imaging, enabling needle/probe guidance. Detecting viable tumor persistence following locoregional treatment (either ablation or chemo/radioembolization). Particularly for metastases, assessment of size must include the perilesional hypervascular halo with wash out. Tumor margins are better detected by CEUS than unenhanced US  because definition of its relationships with surrounding structures is improved, thus, helping develop appropriate treatment strategies and reducing the risks of complications  . Accurate pretreatment planning can be improved by real-time fusion imaging with CT, MRI or CEUS, which provides an accurate volumetric map of the tumor and graphically depicts the number and sites of the ablation volumes needed to cover the whole mass and achieve an adequate perilesion “safety margin”  . Pretreatment CEUS is very helpful for comparison of the patterns before and after treatment. The field depth, selected scan plane, acoustic gain and MI used for the pretreatment CEUS study of each lesion must be predefined. Images and/or video clips should be stored for precise comparison with immediate postablation studies. The ablation device is inserted when the target is optimally depicted. When lesion targeting is particularly difficult (e. g., small lesion size, difficult location), fusion imaging with CT/MRI may allow “targeted” CEUS in some instances  and consequent improvement of ablation needle/probe guidance. Depiction of a “virtual needle” during CEUS provided by fusion imaging may facilitate the procedure. The Response Evaluation Criteria in Solid Tumors (RECIST) guidelines  for the assessment of tumor response are no longer considered adequate for locoregional treatment because of the poor relationship between necrosis and tumor size. After thermal ablations, completely necrotic tumors may remain unchanged in size, whereas tumors that shrink may still be partially viable. Accordingly, the RECIST criteria have been amended, at least for HCC , to stress that the imaging indicator of complete ablation is the disappearance of any previously visualized intralesional enhancement on CEUS. This must be assessed throughout the whole volume of each tumor which has undergone ablation  . The volume of the necrosis achieved should be compared with the pretreatment volume of the tumor(s). Simultaneous display of tissue and contrast is of particular value for follow-up of treated lesions. The volume of necrosis achieved can be compared with the pretreatment volume of the same lesion on CECT or CEMRI using real-time fusion imaging . Completeness of treatment of hypoenhancing lesions (mostly liver metastases) can be assessed by comparing the volume and location of pretreatment lesions with those of the ablated region. This also determines whether a sufficient safety margin around the lesion has been achieved. The frequent occurrence of satellite nodules around small HCC (5 – 10 mm from the main tumor ), dictates that the thickness of the safety margin following ablation should be assessed not only for liver metastases but also for HCC. Unenhanced US is used to monitor the reduction of the hyperechoic “cloud” of gas caused by heating immediately after ablation. This usually takes 5 – 15 min to dissipate. For each treated lesion, the same system settings and scan planes must be used as for the preablation assessment. Images and/or video clips should be stored for comparison with previously stored preablation images. If additional probe/needle insertions are performed, repeated doses of UCA can be given. It is often difficult to depict local tumor recurrence after ablation using B-mode alone. Here, scanning in the late or postvascular phase, with subsequent reinjection to confirm tumor enhancement in any suspicious region is useful to identify the viable tumor adjacent to the ablated volume. This can be used to guide biopsy and additional treatment. While CEUS may be extremely useful to define local recurrence in a treated nodule, CT and MRI provide a better overview of the liver to detect distant intra- and extrahepatic tumor and cannot be replaced by CEUS. In the early postablative evaluation (within the first 30 days), a thin, uniform enhancing rim can be visible along the periphery of the necrotic region, similar to the findings on CECT. Misinterpretation of this perilesional hyperemic halo as residual viable tumor can be avoided by comparing postablation images with preablation scans. As a complement to CECT and/or CEMRI for pretreatment staging and assessment of target lesion vascularity. Facilitation of needle positioning in cases of incomplete or poor lesion delineation on unenhanced US. Evaluation of the immediate treatment effect after ablation and guidance for immediate re-treatment of residual unablated tumor. Using this strategy, the rate of incomplete ablation in the first session is reported to decrease from 16 to 6 % . Assessment of local tumor progression when follow-up CECT or CEMRI are contraindicated or not conclusive. In addition to CECT and/or CEMRI, CEUS may be used in follow-up protocols. Liver transplantation is currently an established first-line treatment for patients with end-stage acute or chronic liver disease but postoperative complications may limit its long-term success and their early detection is extremely important for graft and patient survival. Hepatic artery (HA) thrombosis, which is the most common and severe vascular complication, occurs in 3 – 8 % of transplants in adults  . Acute HA thrombosis almost invariably leads to graft loss from infarction and eventual abscess formation. Hepatic artery stenosis may proceed to thrombosis and may cause ischemic liver and biliary injuries if not promptly corrected. Although portal vein (PV) and hepatic vein or caval thrombosis are less frequent, they are also serious complications that may lead to graft loss . Clinical signs of vascular complications are often nonspecific, and the diagnosis, best made at the presymptomatic stage, depends on imaging. Ultrasound is usually used first to detect vascular complications as well as for long-term follow-up   . Though Doppler is useful, it may be not sensitive enough to depict slow flow in a patent HA, particularly in patients with postoperative edema, inaccessible hepatic arteries, or inability to cooperate . When flow cannot be identified in the HA, CECT or angiography, with their attendant risks, were hitherto required to obtain a definitive answer; CEUS can be used instead and is often able to overcome the limitations of Doppler. The study procedure is as described in section 2.1.2. The intrahepatic arterial tree is well visualized at the time of its enhancement in the early arterial phase, before arrival of contrast microbubbles in the portal system. The right hepatic artery is usually visible anteriorly alongside the right portal branch through a right intercostal scan and the left hepatic artery at the bifurcation of the left portal branch, optimally seen with a supine epigastric approach. The portal vein and its branches are visualized in the portal venous phase, following which the enhancement of the parenchyma can be studied looking for infarcts, which appear as nonenhancing regions. Later the hepatic veins fill and can be studied. When only the vessels are to be explored, a reduced amount of injected contrast may improve their visualization by preventing signal saturation. Lack of visualization of the arterial tree, expected to be seen before portal enhancement, indicates complete arterial thrombosis with very high positive predictive values    . Identification of the arterial branches when conventional Doppler has failed , may allow subsequent targeted Doppler reassessment, which is needed to distinguish thrombosis from slow flow caused by vasoconstriction or splenic steal from post-thrombotic/stenotic recanalization, tasks not achievable using CEUS alone. When the main hepatic artery is visible, CEUS depicts the shape of the lumen and its course, possibly identifying stenoses, which usually occur at the site of the surgical anastomosis . CEUS may also allow study of the shape and patency of the caval and portal anastomoses. Confirmation of occlusion of the intrahepatic hepatic arteries, portal veins, hepatic veins or inferior vena cava (IVC) after an inconclusive Doppler evaluation of the liver vasculature. The extrahepatic arterial tree cannot always be studied in its entirety and complete patency cannot be confirmed with certainty without the addition of the finding of normal flow tracings from the intrahepatic arteries on Doppler US. In the late phase, the ultrasound can be switched to Doppler to exploit the remaining microbubbles to enhance the Doppler signals and investigate small vessels missed without contrast. Confirmation of the presence and assessment of the nature of fluid collections and, in case of recent hematomas, to search for active bleeding. Exclusion of perfusion defects when infarction is suspected. For monitoring the success of thrombolysis in the intensive care unit (ICU) after interventions for hepatic artery occlusion. In the early postoperative period, wounds and surgical dressings or subcutaneous emphysema, may limit examination windows. In patients with split liver transplantation or after living donor liver transplantation, the examination may be more difficult because of the complex anatomy. Imaging the prehepatic portions of the hepatic artery and portal vein may be precluded by the surgical wound or intervening bowel gas. When a side-to-side caval (piggyback) anastomosis is used, the distal part of the donor cava may thrombose and simulate a small subcapsular hematoma. Ascites may collect alongside the ligament teres and may simulate a complex cyst on follow-up examinations. Knowledge of the surgical procedures including the presence of jump grafts, difficult anastomoses and the status of the donor liver may be helpful to interpretation. While CEUS shows the morphology of the vessel lumen, integration with Doppler US is required to confirm the presence of a hemodynamically significant stenosis. Neovascularization is a key stage in the growth of malignancies beyond 2 – 3 mm3. This neoangiogenesis is an important target for novel anticancer treatments and many new antiangiogenesis or antivascular treatments aim at destroying or limiting the growth of tumor vessels  . A new area of clinical utility for dynamic contrast enhanced ultrasound (DCE-US) has emerged for monitoring the response to these drugs. Initially, such monitoring relied on qualitative analyses only. More recently, robust and quantitative features have been developed. To achieve successful results, standardization and strict control of scanner settings are needed . Contrast specific imaging is used to distinguish microbubble signals from tissue. The best temporal and spatial resolution is provided by nonlinear gray scale modes (see section 1.3). Conventional Doppler imaging techniques cannot visualize vessels smaller than approximately 100 μm but CEUS can detect signals from vessels up to 40 μm  and, thus, provides a better assessment of the extent of angiogenesis. Early measurements of contrast kinetics (i. e., time-intensity curves, TIC) were performed using video data because it was readily available. Background subtraction was necessary to compensate for attenuation effects  and extract reliable time-based features, such as time to peak intensity, mean transit time, etc. However, the nonlinear compression applied to the original signals (required to display them on video monitors) distorts amplitude-based TIC features (e. g., peak intensity and area under the curve) . The majority of reports have used uncompressed, post beam formed data (radio-frequency data are not required since the phase information is not essential). TIC based on such raw data sets allow for accurate assessment of both time-based and amplitude-dependent features. All manufacturers that supply built-in analysis packages on their scanners use this type of data but off-line software packages are also available . Related to fractional blood volume: peak intensity (PI); area under the curve (AUC) ; area under the wash in (AUWI); under the wash out (AUWO). Related to blood flow: time to peak intensity (TPI); slope of the wash in (SWI). Related to transit time: mean transit time (MTT). It is also possible to map the changes in TIC features over time and show these as colorized functional images. In this method, originally described for the heart , a high intensity diagnostic series of pulses is transmitted to a tissue slice filled with microbubbles following bolus or infusion injection, to destroy the bubbles within it. The scanner then switches to a low MI and the refill of the slice with microbubbles is monitored with a contrast-specific imaging mode. The refill takes the form of a rising exponential curve whose slope, β, relates to the velocity of blood inflow while the maximum enhancement, A, relates to the fractional blood volume. Their product forms an estimate of tissue perfusion . The advantage of an infusion of UCA is that a concentration equilibrium can be achieved, which makes it easier to compare different tissue regions directly  . With the destruction-reperfusion method only the wash in phase can be assessed, which may limit its utility. The arrival times of a UCA bolus in the hepatic artery, portal vein and hepatic veins can be measured and transit times calculated. Shortening of the transit time between the hepatic artery/portal vein and the hepatic veins occurs in the presence of liver malignancies, presumably because of intrahepatic shunting. However, this also occurs in cirrhosis  , resulting in a nonspecific finding which limits its use in liver malignancy. Its use to stage chronic hepatitis is also limited by the substantial overlap between different stages despite statistically significant differences among groups . Since antiangiogenic treatment frequently induces necrosis without causing tumor shrinkage, functional imaging techniques are particularly suitable for the early assessment of response, a task for which both the RECIST and World Health Organization (WHO) size criteria   are unsatisfactory . Studies of various types of tumors treated with antiangiogenic therapies have confirmed that DCE-US may enable early prediction of response to treatment      . The authors acknowledge the educational contributions provided by the following companies: Bracco; GE Healthcare; Hitachi Medical Systems; Lantheus Medical Imaging; Medison; Philips Medical Systems; Siemens Healthcare; Toshiba Medical Systems; and Supersonic Imagine. The authors gratefully acknowledge Glynis Harvey from the WFUMB office for her efficient management. 142 Torzilli G, Del Fabbro D, Palmisano A et al. Contrast-enhanced intraoperative ultrasonography: a valuable and not any more monocentric diagnostic technique performed in different ways. Ann Surg 2007; 245: 152-153 ; author reply 153. 149 World Health Organisation Offset Publication. WHO Handbook for Reporting Results of Cancer Treatment. Geneva, Switzerland: ISBN 92 4 170048 3. Ed World Health Organisation, 1979.